The concept of evidence-based running shoe selection is nice in theory, but may be easier said than done. In fact, the literature is replete with conflicting findings on a range of issues, from arch height to shoe construction. Running injuries have been associated with altered foot motion or excessive force transmission due to repetitive foot contact with the ground.7-9 Researchers have suggested that running in a shoe specific for one’s foot type can influence rearfoot motion or shock absorption sufficiently to reduce the risk of injury.7 Thus, many clinicians prescribe specific running shoe types based upon individual foot type to minimize risk of injury. The purpose of this article is to provide an overview of specific foot types and associated running shoes, highlight the research to date that addresses the effect of shoe type on running biomechanics and injury risk, and provide an overview of running shoe fitting and replacement guidelines. However, some researchers have reported that the low-arched foot does not place a runner at increased risk for injury.19-21 In fact, Giladi and colleagues have reported that the low-arched foot has a decreased risk of stress fracture compared to either the normal- or high-arched foot.20 The increased motion associated with the flexible, low-arched foot may actually result in increased shock absorption capability, and may therefore protect against specific types of lower extremity injuries associated with running (e.g., stress fractures). The high arched or cavus foot tends to be stiffer than either the low or normal arched foot. Researchers and clinicians generally agree that the rigid, high arched foot places one at increased risk due to its lesser ability to absorb impact forces. The rigid, high-arched foot in runners has been associated with increased risk for lateral, bony and ankle injuries.17 However, it has also been suggested that the flexible, high-arched foot/ankle may not be at increased risk for injury.22 Further, Wen and colleagues have reported that the high-arched foot as determined by arch index measurements may even decrease a runner’s risk both for running injuries in general and for knee injuries specifically.23 They did not suggest why the high arched foot might provide a protective effect. A potential explanation for these findings is that a flexible foot, regardless of arch height, may be better able to absorb shock or impact forces. Figure 2. 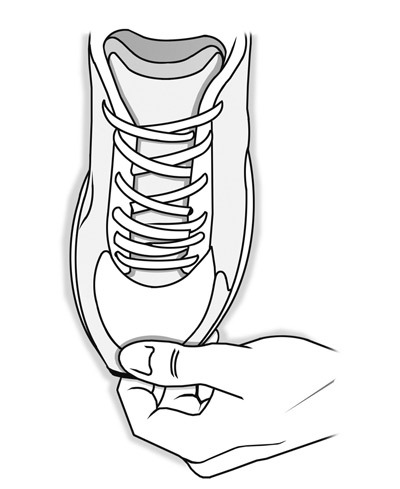 Decreased foot mobility may result in lateral midsole compression and outward shoe tilt. The stability running shoe is generally prescribed for normal arches. It may also be prescribed for low or high arched feet with normal mobility. This shoe generally has a moderately firm, multidensity medial midsole and medial posting. 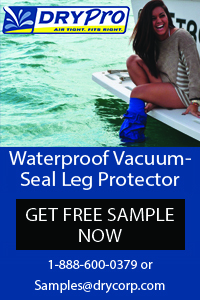 It is designed to provide a balance of medial support and shock absorption. Although many clinicians and researchers focus on rearfoot motion, significant movement occurs at the midfoot during gait.33 Further, Murphy and colleagues have reported high correlation between normalized midfoot contact area and plantar pressure values during gait.34 Further research addressing the relative effects of running shoes on midfoot motion may benefit future efforts to reduce running-related injury risk. A potential limitation to studying biomechanical changes associated with running shoe wear is the response of the human body to changes in footwear or running surfaces. Researchers have proposed that a runner adapts to such changes through neuromuscular control mechanisms or adjustments to running mechanics.22,36,38,39 This adaptive ability could diminish any potential effect of running shoes on rearfoot motion, force transmission or shock absorption. A topic for further study is the potential effect of running shoes on rearfoot motion and/or force transmission once a runner has fatigued.7 Butler and colleagues have proposed that running shoes may exert a greater effect on running mechanics as the runner progressively fatigues.7 It is believed that most running-related injuries occur when a runner is fatigued, as subsequent decreases in volitional muscle strength may result in increased lower extremity joint motion.7 It is also possible that fatigue increases the time required for a runner to react to, or compensate for changes in the running surface. Knapik and colleagues recently assessed the effect of running shoe prescription on injury risk among entry-level military trainees.43 Even when limiting their comparison to high and low arched trainees, Knapik and his fellow researchers found that shoe prescription based on static plantar foot shape did not reduce training-related injury risk when compared to providing each trainee with a pair of new stability running shoes (regardless of static foot type). They subsequently recommended that military trainees merely obtain new running shoes of any type upon beginning entry-level training. Also unknown is the effect of running shoe prescription as a means of secondary injury prevention among currently or previously injured runners. Further unknown is the effect of prescribing running shoes based upon foot mobility rather than upon static foot type alone.7 Thus, it is possible that running shoe prescription based upon foot type might reduce injury risk among runners with higher training volumes or among runners with histories of prior running-related injuries. It is also possible that accounting for foot mobility when categorizing foot type might enable running shoe prescription to reduce injury risk within the general running population. More research is required to determine the effect of running shoe prescription based upon both foot structure and mobility. 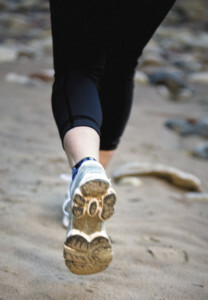 The minimal evidence-based support for running shoe prescription in primary injury prevention has led some to recommend that runners select and replace shoes based solely upon comfort, fit and overall shoe condition. Taunton and colleagues linked older running shoe wear to increased injury risk among women preparing for a 10 km running race.46 Women who ran in shoes that were one to three months old sustained fewer new injuries than women whose shoes were four to six months old. However, in the same study, male runners who wore shoes that were four to six months old sustained fewer injuries than their counterparts who wore newer shoes. Figure 3. 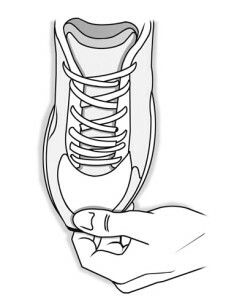 There should be at least half a thumb's width but not more than a full thumb’s width of space between the end of the longest toe and the tip of the shoe. Gardner and colleagues have also identified a “slight trend” linking running shoe age and stress fracture incidence.47 In Gardner’s study, approximately 1.1% of Marine recruits whose running shoes were less than one month old sustained a stress fracture across the study period. In the same study, approximately 1.9% and 2.5% of trainees whose shoes were between one and six months or six and 12 months old sustained a stress fracture. Interestingly, no stress fractures were sustained by recruits whose running shoes were more than one year old. Gardner did not hypothesize as to why these recruits sustained no stress fractures. However, it is possible that at least some of these recruits were regular runners before beginning entry-level military training, and thus were at lower risk of training-related injuries than their previously sedentary counterparts. Figure 4. 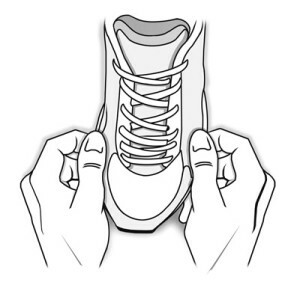 Each side of the shoe should be half a thumb’s width from the edge of the ball of the foot. In regard to shoe comfort, Nigg has proposed that a comfortable running shoe may reduce a runner’s energy expenditure requirement by minimizing muscle activity that occurs in response to shoe wear.26 Shoe comfort could affect injury risk in two ways. First, a lessened energy expenditure requirement could delay the onset of volitional muscle fatigue, as discussed earlier. Also, an uncomfortable running shoe could cause a runner to adopt a compensatory or abnormal gait pattern that subsequently increases the runner’s risk of injury. 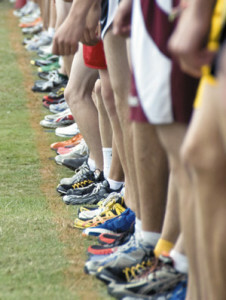 Based upon the available research to date, the U.S. Department of Defense’s Joint Services Physical Training Injury Prevention Work Group has noted that “reports from shoe manufacturers and biomechanical studies on running shoes show that shoes should provide satisfactory support and cushion for 400 to 600 miles of use and, therefore, should be replaced accordingly to prevent injury.”51 However, the Work Group also noted that the evidence to date was insufficient to recommend replacing running shoes at specific mileage intervals to reduce injury risk. Based upon the evidence to date, the authors of this article recommend that a runner replace his or her shoes every 400 to 600 miles. Runners with a history of injuries, those with extremes of arch height/foot mobility, and heavier runners should consider replacing shoes closer to 400 miles of wear. Shoes with evident medial or lateral midsole compression (Figures 1 & 2) require replacement regardless of mileage. In light of the conflicting findings and ongoing debate associated with running shoe-related research, clinicians should emphasize the importance of shoe comfort and be ready to provide appropriate shoe sizing and replacement guidelines to their patients. In regard to running shoe type, clinicians must continue to incorporate good clinical judgment, their knowledge of biomechanics, and individual patient history of running-related injuries to help guide each patient in selecting an appropriate shoe. 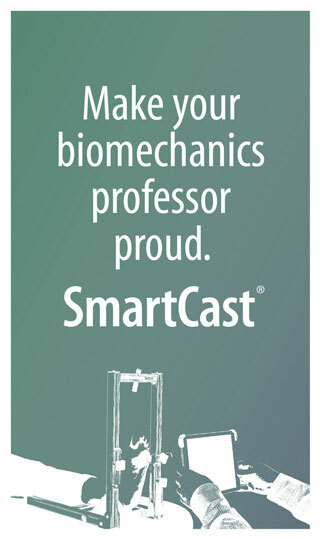 Future research efforts should focus on measures of shock absorption and rearfoot motion control while the runner is fatigued, the impact of running shoe prescription on injury incidence among moderate to high mileage runners, running shoe prescription as a means of secondary injury prevention, and the effect of shoe prescription based upon foot mobility rather than static foot type alone. Joseph M. Molloy, PT, PhD, SCS, is adjunct faculty for the U.S. Army-Baylor University Doctoral Program in Physical Therapy, and clinical internship director in the Physical Therapy Service at Brooke Army Medical Center, both in Fort Sam Houston, TX. Deydre S. Teyhen, PT, PhD, OCS, is an associate professor and director of the Center for Physical Therapy Research in the U.S. Army-Baylor University Doctoral Program in Physical Therapy. The opinions or assertions contained in this article are the views of the authors and should not be construed as official or reflecting the views of the United States Army or the Department of Defense. 1. Running USA 2008 State of the Sport Part 1. Available at http://www.runningusa.org/statistics/reports/2008_1; accessed 26 November 2009. 3. Van Mechelen W. Running injuries: A review of the epidemiological literature. Sports Med 1992;14(5):320-325. 4. Asplund CA, Brown DL. The running shoe prescription: fit for performance. Phys Sportsmed 2005;33(1):17-24. 5. Lun V, Meeuwisse WH, Stergiou P, Stefanyshyn D. Relation between running injury and static lower limb alignment in recreational runners. Br J Sports Med 2004;38(5):576-580. 6. Smith TA, Cashman TM. The incidence of injury in light infantry soldiers. Mil Med 2002;167(2):104–108. 7. Butler RJ, Davis IS, Hamill J. Interaction of arch type and footwear on running mechanics. Am J Sports Med 2006;34(12):1998-2005. 8. James SL, Bates BT, Osternig LR. Injuries to runners. Am J Sports Med 1978;6(2):640-650. 9. Milgrom C, Giladi M, Kashtan H, et al. A prospective study on the effect of a shock-absorbing orthotic device on the incidence of stress fractures in military recruits. Foot Ankle 1985;6(2):101-104. 10. Subotnick SI. The biomechanics of running. Implications for the prevention of foot injuries. Sports Med 1985;2(2):144-153. 11. Teyhen DS, Stoltenberg, BE, Collinsworth KM, et al. Dynamic plantar pressure parameters associated with static arch height index during gait. Clin Biomech 2009;24(4):391-396. 12. Accession Medical Standards Analysis & Research Activity. 2003 annual report: EPTS discharges for pes planus in 2001: case series review. Available at http://www.amsara.amedd.army.mil/report/reportindex.asp?strReportChoice=3_14; accessed March 20, 2010. 13. Burns J, Crosbie J, Hunt A, Ouvrier R. The effect of pes cavus on foot pain and plantar pressure. Clin Biomech 2005;20(9):877-882. 14. Burns J, Keenan A, Redmond A. Foot type and overuse injury in triathletes. J Am Podiatr Med Assoc 2005;95(3):235-241. 15. Igbigbi PS, Msamati BC. The footprint ratio as a predictor of pes planus: A study of indigenous Malawians. J Foot Ankle Surg 2002;41(6):394-397. 16. Kaufman KR, Brodine SK, Shaffer RA, et al. The effect of foot structure and range of motion on musculoskeletal overuse injuries. Am J Sports Med 1999;27(5):585-593. 17. Williams DS 3rd, McClay IS, Hamill J. Arch structure and injury patterns in runners. Clin Biomech 2001;16(4):341-347. 18. Boling MC, Padua DA, Marshall SW, et al. A prospective investigation of biomechanical risk factors for patellofemoral pain syndrome: the joint undertaking to monitor and prevent ACL injury (JUMP-ACL) cohort. Am J Sports Med 2009;37(11):2108-2116. 19. Jones BH, Knapik JJ. Physical training and exercise-related injuries: surveillance, research and injury prevention in military populations. Sports Med 1999;27(2):111-125. 20. Giladi M, Milgrom C, Stein M, et al. The low arch, a protective factor in stress fractures. Orthop Rev 1985;14:709-712. 21. Stefanyshyn DJ, Stergiou P, Lun VMY, Meeuwisse WH. Dynamic variables and injuries in running. Proceedings of the 5th Symposium on Footwear Biomechanics, Zurich, Switzerland, 2001:74-75. 22. Knapik JJ, Feltwell D, Canham-Chervak M. Evaluation of injury rates during implementation of the Fort Drum Running Shoe Injury Prevention Program. U.S. Army Center for Health Promotion and Preventive Medicine Report 12-MA-6558-01, Aberdeen Proving Grounds, MD; 2001. 23. Wen DY, Puffer TC, Schmalzried TP. Injuries in runners: a prospective study of alignment. Clin J Sports Med 1998;8(3):187-194. 24. Squadrone R, Gallozzi C. Biomechanical and physiological comparison of barefoot and two shod conditions in experienced barefoot runners. J Sports Med Phys Fitness 2009;49(1):6-13. 25. Cortese A. “Wiggling their toes at the shoe giants,” New York Times, August 30, 2009. Available at http://www.nytimes.com/2009/08/30/business/30shoe.html. Accessed January 7, 2010. 26. Nigg BM. The role of impact forces and foot pronation: a new paradigm. Clin J Sport Med 2001;11(1):2-9. 27. Stacoff A, Reinschmidt C, Nigg BM et al. Effects of shoe sole construction on skeletal motion during running. Med Sci Sports Exerc 2001;33(2):311-319. 28. Reinschmidt C, Nigg BM. 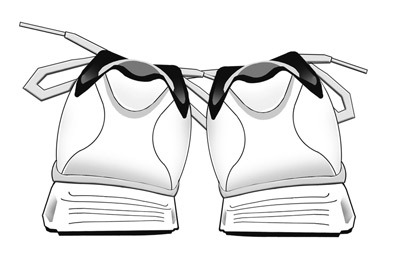 Current issues in the design of running and court shoes. Sportverletz Sportschaden 2000;14(3):71-81. 29. Clarke TE, Frederick EC, Hamill CL. The effects of shoe design parameters on rearfoot control in running. Med Sci Sports Exerc 1983;15(5):376-381. 30. De Wit B, De Clercq D, Lenoir M. The effect of varying midsole hardness on impact forces and foot motion during foot contact in running. J Appl Biomech 1995;11(4):395-406. 31. Hamill J, Bates BT, Holt KG. Timing of lower extremity joint actions during treadmill running. Med Sci Sports Exerc 1992;24(7):807-813. 32. Molloy JM, Christie DS, Teyhen DS, et al. Effect of running shoe type on the distribution and magnitude of plantar pressures in individuals with low- or high-arched feet. J Am Podiatr Med Assoc 2009;99(4):330-338. 33. Barnes A, Wheat J, Milner C. Association between foot type and tibial stress injuries: a systematic review. Br J Sports Med 2008;42(2):93-98. 34. Murphy DF, Beynnon BD, Michelson JD et al. Efficacy of plantar loading parameters during gait in terms of reliability, variability, effect of gender and relationship between contact area and plantar pressure. Foot Ankle Int 2005;26(2):171-179. 35. Wegener C, Burns J, Penkala S. Effect of neutral-cushioned running shoes on plantar pressure loading and comfort in athletes with cavus feet. Am J Sports Med 2008;36(11):2139-2146. 36. Nigg BM, Bahlsen HA, Luethi SM, Stokes S. The influence of running velocity and midsole hardness on external impact forces in heel-toe running. J Biomech 1987;20(10):951-959. 37. Nigg BM, Liu W. The effect of muscle stiffness and damping on simulated impact force peaks during running. J Biomech 1999;32(8):849-856. 38. Snel JG, Delleman NJ, Heerkens YF, van Ingen Schenau GJ. 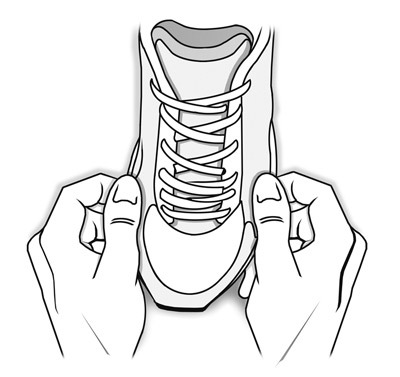 Shock-absorbing characteristics of running shoes during actual running. In: Winter DA, Norman RW, Wells RP, et al, eds. Biomechanics IX-B. Champaign, Ill: Human Kinetics, 1985:133-137. 39. Kong PW, Candelaria NG, Smith DR. Running in new and worn shoes: a comparison of three types of cushioning footwear. Br J Sports Med 2009;43(10):745-749. 40. Butler RJ, Hamill J, Davis I. 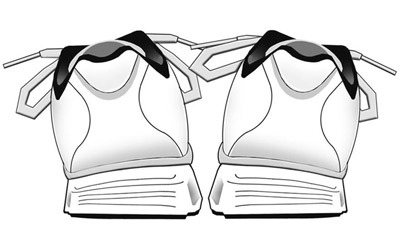 Effect of footwear on high and low arched runners’ mechanics during a prolonged run. 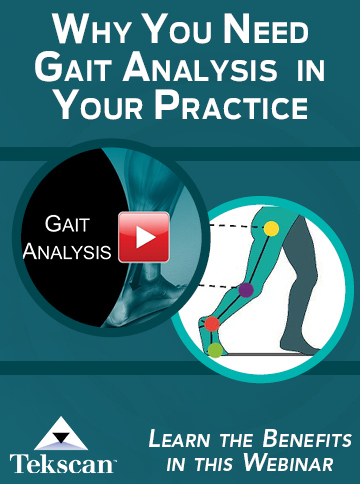 Gait & Posture 2007;26(2):219–225. 41. Richards CE, Magin PJ, Callister R. Is your prescription of distance running shoes evidence-based? Br J Sports Med 2009;43(3):159-162. 42. Hennig EM. Plantar pressures, shock and rearfoot motion during running – are these meaningful quantities for the prediction of running injuries? Presented at IV World Congress of Biomechanics, Calgary, August 2002. 43. Knapik JJ, Swedler DI, Grier TL, et al. Injury reduction effectiveness of selecting running shoes based on plantar shape. J Strength Cond Res 2009;23(3):685-697. 44. Yeung EW, Yeung SS. A systematic review of interventions to prevent lower limb soft tissue running injuries. Br J Sports Med 2001;35(6):383-389. 45. Fredericson M, Misra AK. Epidemiology and aetiology of marathon running injuries. Sports Medicine 2007;37(4-5):437-439. 46. Taunton JE, Ryan MB, Clement DB, et al. A prospective study of running injuries: the Vancouver Sun Run “In Training” clinics. Br J Sports Med 2003;37(3):239–244. 47. Gardner LI Jr, Dziados JE, Jones BH, et al. Prevention of lower extremity stress fractures: a controlled trial of a shock-absorbent insole. Am J Public Health 1988;78(12):1563-1567. 48. Cook SD, Kester MA, Brunet ME. 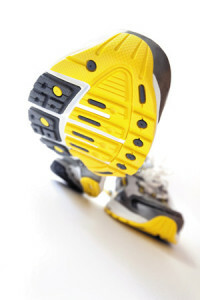 Shock absorption characteristics of running shoes. Am J Sports Med 1985;13(4):248-253. 49. Zhang S, Wortley M, Clowers K, Kohstall C. Longitudinal characteristics of plantar pressure measurements of a running shoe. Presented at American Society of Biomechanics, Toledo, OH, August 2003.
lxxvii Requires reference to upcoming conversation with Dr. Steven Bullock, U.S. Army Center for Health Promotion and Preventive Medicine. 51. Bullock SH, Jones BH. Recommendations for prevention of physical training (PT)-related injuries: results of a systematic evidence-based review by the Joint Services Physical Training Injury Prevention Work Group (JSPTIPWG). U.S. Army Center for Health Promotion and Preventive Medicine Report 21-KK-08QR-08. Aberdeen Proving Ground, MD; 2008.